RevK®'s rants: Fibre optic cable? To be fair to Virgin they are being a tad more careful with their wording now, but only just. They sell "super fast broadband through fast fibre optic cable". Well, there will be fibre somewhere just like every single broadband you can buy which will have fibre optic cable for some of it, even if that is from the exchange back in to the Internet. They go on to say "Our fibre optic cable is high tech all the way" which is a tad devious as it is not "fibre optic cable" all the way, is it! They get a bit more dodgy when they say "Because our broadband comes down fibre optic cable instead of your phone line,..." which is misleading. It does not come down fibre optic cable instead of my phone line - the bit that is instead of my phone line, certainly at my end of my phone line (if I has one), is plainly copper coax cable as can be seen in this picture. 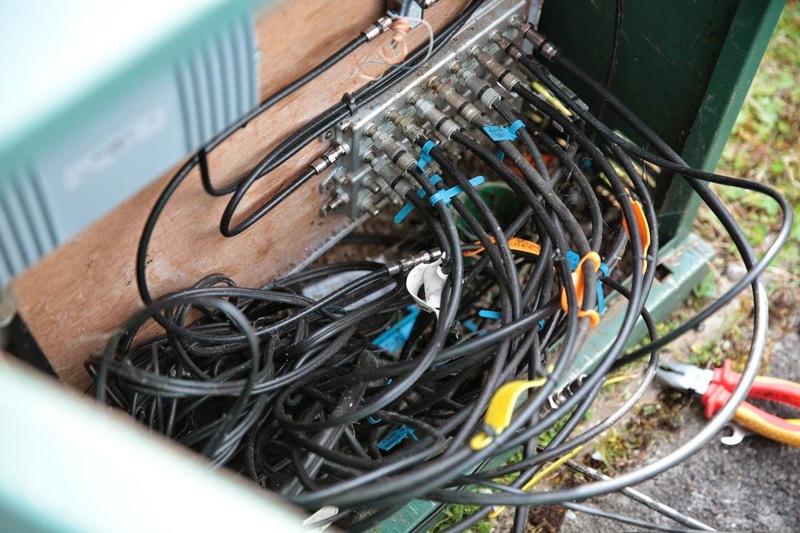 Indeed, this is not even "Fibre To The Cabinet" which is what one would get from BT. They do call it "Our fibre optic broadband" still. My real gripe here is with the ASA allowing them to call something that is plainly not fibre optic to be sold as fibre optic broadband. Show me one fibre in that picture? Even so, the engineers that came were professional and did a good job, in spite of the obvious mistake in the cab (visible in picture above) and a faulty isolation unit. They missed their AM slot because the dig crew were late, which is a shame. However, I do rather have to explain myself here - WTF have I got Virgin broadband at my home?!?!?!? Don't panic, I have not lost the plot or turned to the dark side. It is all part of work with the Open Rights Group to monitor the state of Internet filtering. Even so, it was rather weird being a normal customer for a change. Obviously the service is simply VLANed back to my office where they have BT, Sky, TalkTalk and Plusnet as well. because the ASA are bunch of incompetent bar stewards that let them get away with this crap. its like selling a car as being able to sail the oceans because you know, it got here on a boat so at some point it did sail the high seas. If the service is VLANed to your office, how do you monitor Internet filtering? Are you sure its not fibre to the cabinet? 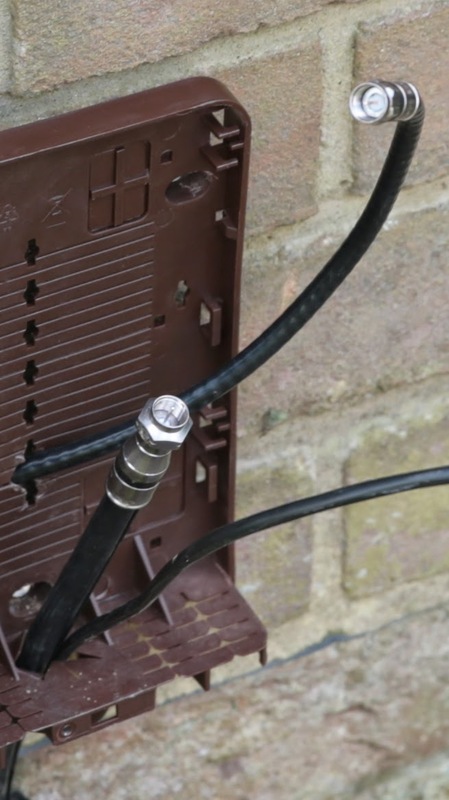 I have Virgin cable and live some distance away from the cabinet and even with their thicker lower loss cable the loss down the cable is quite significant to the point where I need to be connected early in the chain in order to get a good signal. I cant imagine co-ax to the cabinet actually working. Perhaps it comes in as fibre but breaks out to co-ax at a point you cant see. Depends on the area, Around here it's a Fibre to a fairly large cabnet (Which also has active cooling so you can hear the fans in it quite often) and then I believe Coax to smaller distribution cabs around the area. I'm not sure what the maximum distance between the large cab and the end user is. @leighporter I assume the virgin cable is passed back to the office over a vlan so that effectively the office has a virgin internet connection. I suspect there may be something about Virgin not allowing a residential service to be installed to a business address and if they installed a business service it might have different or no filtering. Residential, that is the point of the test as well. Someone said (and I managed to delete by mistake): Aside from the claim "Because our broadband comes down fibre optic cable instead of your phone line,..." specifically, which is clearly a blatant lie, I fail to see how this is significantly different from FTTC being advertised as "fibre optic broadband" when it isn't. Equally irksome. Maybe I just lack a trained eye but other than being a mess, what's wrong in the top picture? Second splitter is not connected at all bit its feed goes direct to someone. If your business needs between 2 and 8 voice lines, then is what you need, if you need 8 lines or more then ISDN30 is a better option. I nearly rejected this post as the spam it is, but thought it worth answering. ISDN30 is usually available from 8 to 30 channels hence the comment. But ISDN30 stopped being sensible about 5 years ago, if not more. A 2Mb/s capable broadband line with 2Mb/s uplink can do a lot more than 8 channels of VoIP at a fraction of the cost of ISDN30 and massively more flexible. Even with dedicated broadband for the VoIP services it is massively cheaper and more flexible to go down the VoIP route now. ISDN30 is long dead. It is not hard to see this - so why on earth would someone spam my blog which such crap in this day and age, let alone try running a business on such an outdated model? My local VM cabinet is about 40m away. Engineer told me it is not fed by fibre but by cable from another cabinet, i.e. it is a spur. This suffices for now, (I get 60Mbits/s) but apparently when speeds increase it will be upgraded to be fibre fed. Makes their 'optical fibre' marketing claim even more untrue. BT 7 hour fix, a con?